This article is about the Hindu goddess. For the Vedic river, see Sarasvati River. For the 1970 film, see Saraswathi (film). For the galaxy supercluster, see Saraswati Supercluster. Saraswati (Sanskrit: सरस्वती, IAST: Sarasvatī) is the Hindu goddess of knowledge, music, art, wisdom, and learning. She is a part of the trinity (Tridevi) of Saraswati, Lakshmi, and Parvati. All the three forms help the trinity of Brahma, Vishnu, and Shiva to create, maintain, and regenerate-recycle the Universe, respectively. The earliest known mention of Saraswati as a goddess is in the Rigveda. She has remained significant as a goddess from the Vedic period through modern times of Hindu traditions. Some Hindus celebrate the festival of Vasant Panchami (the fifth day of spring, and also known as Saraswati Puja and Saraswati Jayanti in so many parts of India) in her honour, and mark the day by helping young children learn how to write the letters of the alphabet on that day. The Goddess is also revered by believers of the Jain religion of west and central India, as well as some Buddhist sects. Saraswati, is a Sanskrit fusion word of saras (सरस्) meaning "pooling water", but also sometimes translated as "speech"; and vati (वती) meaning "she who possesses" (also found in the name of Parvati, "She who has wings"). Originally associated with the river or rivers known as Saraswati, this combination therefore means "she who has ponds, lakes, and pooling water" or occasionally "she who possesses speech". It is also a Sanskrit composite word of surasa-vati (सुरस-वति) which means "one with plenty of water". The word Saraswati appears both as a reference to a river and as a significant deity in the Rigveda. In initial passages, the word refers to the Sarasvati River and is mentioned as one among several northwestern Indian rivers such as the Drishadvati. Saraswati, then, connotes a river deity. In Book 2, the Rigveda describes Saraswati as the best of mothers, of rivers, of goddesses. Best of mothers, best of rivers, best of goddesses, Sarasvatī. Saraswati is known by many names in ancient Hindu literature. 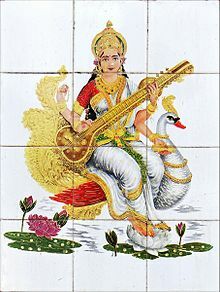 Some examples of synonyms for Saraswati include Brahmani (power of Brahma), Brahmi (goddess of sciences), Bharadi (goddess of history), Vani and Vachi (both referring to the flow of music/song, melodious speech, eloquent speaking respectively), Varnesvari (goddess of letters), Kavijihvagravasini (one who dwells on the tongue of poets). Goddess Saraswati is also known as Vidyadatri (Goddess who provides knowledge), Veenavadini (Goddess who plays veena, the musical instrument held by Goddess Saraswati), Pustakdharini (Goddess carrying book with herself), Veenapani (Goddess carrying veena in her hands), Hansavahini (Goddess who sits on swan) and Vagdevi (Goddess of speech). In the Hindi language, her name is written Hindi: सरस्वती. In the Telugu, Sarasvati is also known as Chaduvula Thalli (చదువుల తల్లి) and Shārada (శారద). In Konkani, she is referred to as Shārada, Veenapani, Pustakadhārini, Vidyadāyini. 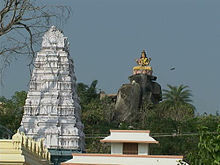 In Kannada, variants of her name include Sharade, Sharadamba, Vāni, Veenapani in the famous Sringeri temple. In Tamil, she is also known as Kalaimagal (கலைமகள்), Kalaivāni (கலைவாணி), Vāni (வாணி) and Bharathi. She is also addressed as Sāradā (the one who offers sāra or the essence), Shāradā (the one who loves the autumn season), Veenā-pustaka-dhārini (the one holding books and a Veena), Vāgdevi, Vāgishvari, (both meaning "goddess of speech"), Vāni (speech), Varadhanāyaki (the one bestowing boons), Sāvitri (consort of Brahma), Gāyatri (mother of Vedas). In India, she is locally spelled as ￼￼Assamese_language:সৰস্বতী,Saraswati, Bengali: সরস্বতী, Saraswati ?, Malayalam: സരസ്വതി, Saraswati ?, and Tamil: சரஸ்வதி, Sarasvatī ?. In Odia as ସରସ୍ଵତୀ Saraswati. Outside Nepal and India, she is known in Burmese as Thurathadi (သူရဿတီ, pronounced [θùja̰ðədì] or [θùɹa̰ðədì]) or Tipitaka Medaw (တိပိဋကမယ်တော်, pronounced [tḭpḭtəka̰ mɛ̀dɔ̀]), in Chinese as Biàncáitiān (辯才天), in Japanese as Benzaiten (弁才天/弁財天) and in Thai as Suratsawadi (สุรัสวดี) or Saratsawadi (สรัสวดี). Saraswati became a prominent deity in Buddhist iconography – the consort of Manjushri in 1st millennium CE. In some instances such as in the Sadhanamala of Buddhist pantheon, she has been symbolically represented similar to regional Hindu iconography, but unlike the more well known depictions of Saraswati. Her dhyana mantra describes her to be as white as the moon, clad in a white dress, bedecked in white ornaments, radiating with beauty, holding a book and a pen in her hands (the book represents knowledge). She is generally shown to have four arms, but sometimes just two. When shown with four hands, those hands symbolically mirror her husband Brahma's four heads, representing manas (mind, sense), buddhi (intellect, reasoning), citta (imagination, creativity), and ahamkāra (self consciousness, ego). Brahma represents the abstract, while she represents action and reality. A hamsa or swan is often shown near her feet. In Hindu mythology, the hamsa is a sacred bird, which if offered a mixture of milk and water, is said to be able to drink the milk alone. It thus symbolizes the ability to discriminate between good and evil, essence from outward show, and the eternal from the evanescent. Due to her association with the swan, Saraswati is also referred to as Hamsavāhini, which means “she who has a hamsa as her vehicle”. The swan is also a symbolism for spiritual perfection, transcendence and moksha. In some texts it is written that once there a terrible battle the Bhargavas and Hehayas, from this a all consuming fire which could destroy everything was born called Vadavagni. The devas were worried and they went to Shiva. Shiva suggested that they should go to Saraswati for help as she can become a river and immerse the Vadavagni in the ocean. All the devas and devis went to Saraswati and requested her to protect the universe. She told that she would only agree if her consort, Bramha told her to do so. Then they all went to Bramha and Bramha told Saraswati to become a river. Saraswati agreed and leaves brahmaloka and arrived to earth at sage uttanka's ashram. There she met Shiva . He gave the Vadavagni in a pot to Saraswati and told her originate from Plaksha tree. Plaksha tree was ready to bear Saraswati and then Saraswati merged with the tree and transformed into a river. From there she flowed towards Pushkar. Saraswati continued her journey towards ocean. At last, she reached the end of her journey and immersed the fire in the ocean. There are many avatars of Goddess Saraswati. Savitri and Gayatri are consider as two wives of Brahma. 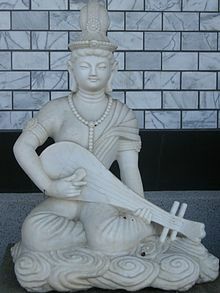 Mahasaraswati is also one form of Saraswati. She also take her Matrika (Warrior avatar) as Brahmani. Saraswati is not just the goddess of knowledge and wisdom but also she is the Brahmavidya herself, the goddess of the wisdom of ultimate truth. Her Mahavidhya forms are Matangi and Tara mahavidhya she manifests : as Parvati she is Vagbhavashwari, the ultimate truth! as Lakshmi she is Vidyalakshmi, gives knowledge to seekers as Buddhi, she protects her children from Maya, the other wife of Ganesha, Siddhi herself as Parijata, she is the wish fulfilling tree. In some regions of India, such as Vindhya, Odisha, West Bengal and Assam, as well as east Nepal, Saraswati is part of the Devi Mahatmya mythology, in the trinity (Tridevi) of Mahakali, Mahalakshmi and Mahasaraswati. This is one of many different Hindu legends that attempt to explain how the Hindu trinity of gods (Brahma, Vishnu and Shiva) and goddesses (Saraswati, Lakshmi and Parvati) came into being. Various Purana texts offer alternate legends for Maha Saraswati. Wielding in her lotus-hands the bell, trident, ploughshare, conch, pestle, discus, bow, and arrow, her lustre is like that of a moon shining in the autumn sky. She is born from the body of Gauri and is the sustaining base of the three worlds. That Mahasaraswati I worship here who destroyed Sumbha and other asuras. 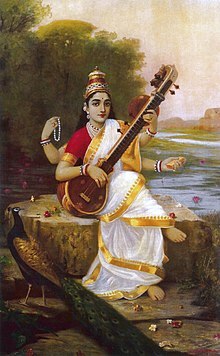 Mahasaraswati is also part of another legend, the Navshaktis (not to be confused with Navdurgas), or nine forms of Shakti, namely Brahmi, Vaishnavi, Maheshwari, Kaumari, Varahi, Narsimhi, Aindri, Shivdooti and Chamunda, revered as powerful and dangerous goddesses in eastern India. They have special significance on Navaratri in these regions. All of these are seen ultimately as aspects of a single great Hindu goddess, with Maha Saraswati as one of those nine. Sharada Peeth temple at Sharda village in PoK. Sharada Peeth is an abandoned Hindu temple and ancient centre of learning along the Kishanganga River in Sharda village of Pakistan administered Kashmir. Between the 6th and 12th centuries CE, it was one of the foremost centres of higher learning in the Indian subcontinent, hosting scholars such as Kalhana, Adi Shankara, Vairotsana, Kumarajiva, and Thonmi Sambhota. It is also said to be where Pāṇini and Hemachandra completed and stored their writings on Sanskrit grammar. Sharada script is a native script of Kashmir and is named after Śāradā, another name for Saraswati, the goddess of learning. As part of INR1200 crore Morni to Kalesar tourism development plan announced in January 2019, Government of Haryana is developing the historic Sharda Mata Temple of Chotta Trilokpur, along with Kalesar Mahadev temple, Kapal Mochan Tirth, Panchmukhi Hanuman temple of Basatiyawala, Lohgarh fort capital of Banda Singh Bahadur. Ancient Sharada Peeth in Pakistan’s Azad Kashmir is one of the oldest surviving temples of Saraswati. about 25 kilometres from Tiruvarur. In her identity as Brahmani, additional Sarasvati temples can be found throughout Gujarat, Himachal Pradesh, Rajasthan, and Uttar Pradesh. One of the most famous festivals associated with Goddess Saraswati is the Hindu festival of Vasant Panchami. Celebrated on the 5th day in the Hindu calendar month of Magha (month), it is also known as Saraswati Puja and Saraswati Jayanti in India. In Assam , West Bengal and Tripura, Goddess Saraswati is worshipped on Vasant Panchami, a Hindu festival celebrated every year on the 5th day in the Hindu calendar month of Magha (about February). Hindus celebrate this festival in temples, homes and educational institutes alike. In Bihar and Jharkhand, Vasant Panchami is commonly known as Saraswati Puja. On this day, Goddess Saraswati is worshipped in schools, colleges, educational institutes as well as in institutes associated with music and dance. Cultural programmes are also organised in schools and institutes on this day. People especially students worship Goddess Saraswati also in pandals (a tent made up of colourful cloths, decorated with lights and other decorative items). In these states, on the occasion of Saraswati Puja, Goddess Saraswati is worshipped in the form of idol, made up of soil. On Saraswati Puja, the idol is worshipped by people and prasad is distributed among the devotees after puja. Prasad mainly consists of boondi (motichoor), pieces of carrot, peas and Indian plum (ber). On the next day or any day depending on religious condition, the idol is immersed in a pond (known as Murti Visarjan or Pratima Visarjan) after performing a Havana (immolation), with full joy and fun, playing with abir and gulal. After Pratima Visarjan, members involved in the organisation of puja ceremony eat khichdi together. In 2018, the Haryana government launched and sponsored the annual National Saraswati Mahotsav in its state named after Saraswati. In Kerala and Tamil Nadu, the last three days of the Navaratri festival, i.e., Ashtami, Navami, and Dashami, are celebrated as Sarasvati Puja. Saraswathi Devi idol at home. The celebrations start with the Puja Vypu (Placing for Worship). It consists of placing the books for puja on the Ashtami day. It may be in one's own house, in the local nursery school run by traditional teachers, or in the local temple. The books will be taken out for reading, after worship, only on the morning of the third day (Vijaya Dashami). It is called Puja Eduppu (Taking [from] Puja). Children are happy, since they are not expected to study on these days. On the Vijaya Dashami day, Kerala and Tamil Nadu celebrate the Ezhuthiniruthu or Initiation of Writing for the little children before they are admitted to nursery schools. This is also called Vidyarambham. The child is made to write for the first time on the rice spread in a plate with the index finger, guided by an elder of the family or by a teacher. Watugunung, the last day of the pawukon calendar, is devoted to Saraswati, goddess of learning. Although it is devoted to books, reading is not allowed. The fourth day of the year is called Pagerwesi, meaning "iron fence". It commemorates a battle between good and evil. Saraswati is an important goddess in Balinese Hinduism. She shares the same attributes and iconography as Saraswati in Hindu literature of India – in both places, she is the goddess of knowledge, creative arts, wisdom, language, learning and purity. In Bali, she is celebrated on Saraswati day, one of the main festivals for Hindus in Indonesia. The day marks the close of 210 day year in the Pawukon calendar. In Tibet, she is known as Yang chen ma (Singing/Music Goddess), or Yang chen drolma (Singing/Music Tara) considered the consort of Mañjuśri, Buddha of Wisdom, she is one of the 21 Taras. Saraswati is the Divine Embodiment & bestower of Enlightened Eloquence & Inspiration, patroness of the arts, sciences, music, language, literature, history, poetry & philosophy, all those engaged in creative endeavours in Tibetan Buddhism. She is considered the peaceful manifestation of Palden Lhamo(Glorious Goddess). In the Gelugpa tradition, Palden Lhamo is known as Magzor Gyalmo(the Queen who Repels Armies) and is a wrathful emanation of Saraswati while being a protector. Saraswati was the yidam (principal personal meditational deity) of 14th century Tibetan monk Je Tsongkhapa. He composed a devotional poem to her. She is believed in the Tibetan tradition to have accompanied him on his travels, as well as regularly engaging in conversations with him. Aban, "the Waters", representing and represented by Aredvi Sura Anahita. Arachosia name of which derives from Old Iranian *Harahvatī (Avestan Haraxˇaitī, Old Persian Hara(h)uvati-). Hara Berezaiti, "High Hara", the mythical mountain that is the origin of the *Harahvatī river. Sarasvati River, a manifestation of the goddess Saraswati. ^ Dowling, Elizabeth; Scarlett, W George (2005). Encyclopedia of Religious and Spiritual Development. SAGE Publications. p. 204. ISBN 978-0761928836. ^ a b c d e f g Kinsley, David (1988). Hindu Goddesses: Vision of the divine feminine in the Hindu religious traditions. University of California Press. pp. 55–64. ISBN 0-520063392. ^ Encyclopaedia of Hinduism. Sarup & Sons. p. 1214. ISBN 978-81-7625-064-1. ^ a b c Kinsley, David (1988). Hindu Goddesses: Vision of the divine feminine in the Hindu religious traditions. University of California Press. ISBN 0-520-06339-2. ^ "Vasant Panchami Saraswati Puja". Know India – Odisha Fairs and Festivals. Archived from the original on 23 September 2014. ^ "The festival of Vasant Panchami: A new beginning". United Kingdom: Alan Barker. Archived from the original on 4 October 2015. ^ Guide to the collection. Birmingham Museum of Art. Birmingham, Alabama: Birmingham Museum of Art. 2010. p. 55. ISBN 978-1-904832-77-5. Archived from the original on 14 May 1998. ^ a b Donaldson, Thomas (2001). Iconography of the Buddhist Sculpture of Orissa. pp. 274–275. ISBN 978-8170174066. ^ "सुरस". Sanskrit English Dictionary,. Koeln, Germany: University of Koeln. Archived from the original on 4 December 2014. ^ a b c d Muir, John. Original Sanskrit Texts on the Origin and History of the People of India – Their Religions and Institutions. 5. pp. 337–347 – via Google Books. ^ "Rigveda". Book 2, Hymn 41, line 16. Archived from the original on 24 September 2015. ^ "Rigveda". Book 10, Hymn 17. Archived from the original on 8 May 2015. ^ Colbrooke, H.T. Sacred writings of the Hindus. London, UK: Williams & Norgate. pp. 16–17. Archived from the original on 10 March 2016. ^ Moor, Edward. The Hindu Pantheon. pp. 125–127 – via Google Books. ^ "Sarasvati, The Goddess of Learning". Stephen Knapp. Archived from the original on 27 April 2009. ^ a b Balf, Edward. The Encyclopædia of India and of Eastern and Southern Asia. p. 534 – via Google Books. ^ Kinsley, David (1988). Hindu Goddesses: Vision of the divine feminine in the Hindu religious traditions. University of California Press. p. 95. ISBN 0-520-06339-2 – via Google Books. ^ Reader, Ian; Tanabe, George J. Practically Religious: Worldly benefits and the common religion of Japan. University of Hawaii Press. ISBN 978-0824820909. ^ a b History and Antiquities, the Arts, Sciences and Literature of Asia. Asiatic Researches. 3. London, UK. pp. 272–273 – via Google Books. ^ Ludvík, Catherine (2007). Sarasvatī, Riverine Goddess of Knowledge: From the Manuscript-carrying Vīṇā-player to the Weapon-wielding Defender of the Dharma. BRILL. p. 1. ^ a b Holm, Jean; Bowke, John (1998). Picturing God. Bloomsbury Academic. pp. 99–101. ISBN 978-1855671010. ^ "Hinduism 101 Saraswati Symbolism". Hindu American Foundation (HAF). Archived from the original on 16 October 2017. Retrieved 10 February 2018. ^ a b c Pollock, Griselda; Turvey-Sauron, Victoria (2008). The Sacred and the Feminine: Imagination and sexual difference. pp. 144–147. ISBN 978-1845115203. ^ For Sanskrit to English translation of the four words: "Monier Williams' Sanskrit-English Dictionary". Koeln, Germany: University of Koeln. Archived from the original on 20 August 2016. ^ Some texts refer to her as "goddess of harmony"; for example: Wilkes, John. Encyclopaedia Londinensis. 22. p. 669 – via Google Books. ^ Schuon, Frithjof (2007). Spiritual Perspectives and Human Facts. p. 281. ISBN 978-1933316420. ^ Werness, Hope B. (2007). Animal Symbolism in World Art. Continuum Encyclopedia. Bloomsbury Academic. pp. 319–320. ISBN 978-0826419132. ^ Saraswati. Amar Chitra Katha. ISBN 978-93-5085-120-3. ^ Stories of the goddess of wisdom. Saraswati. Amar Chitra Katha. ISBN 978-93-5085-120-3. ^ Lochtefeld, James. The Illustrated Encyclopedia of Hinduism. A–M. p. 408. ISBN 978-0823931804. ^ Eck, Diana L. (2013). India: A sacred geography. Random House. pp. 265–279. ISBN 978-0385531924. ^ Brown, C. Mackenzie (1990). The Triumph of the Goddess. State University of New York Press. ISBN 978-0791403648. ^ Lochtefeld, James. The Illustrated Encyclopedia of Hinduism. N–Z. p. 467. ISBN 978-0823931804. ^ Raina, Mohini Qasba (2013). Kashur: The Kashmiri Speaking People. p. 191. ISBN 1490701656. The main centre of excellence was at Sharda Peeth - an ancient seat of learning on the banks of the river Kishenganga in the valley of Mount Harmukh. ^ Raina, Dina Nath (1994). Kashmir - distortions and reality. Michigan: Reliance Publishing House, University of Michigan. p. 37. ISBN 8185972524. ... during which Kashmir emerged as the "Sharda Peeth", a hallowed place for ancient learning. ^ a b c d Raina, Mohini Qasba (2013). Kashur: The Kashmiri Speaking People. p. 191. ISBN 1490701656. ^ Pollock, Sheldon (2006). The Language of the Gods in the World of Men. Los Angeles: University of California Press. p. 182. ISBN 0520245008. ... accordingly, being stored in its most perfect form in the temple of the Goddess of Speech in the far-off land of Kashmir, from where Hemacandra acquired his supremely authoritative exemplars, grammar was at the same time clearly a precious cultural good, one that could be imported and whose very possession secured high prestige for its possessor. ^ "Pandits to visit Sharda temple". The Hindu. 17 May 2006. Retrieved 13 August 2012. ^ "Kalesar-Kalka stretch to be promoted for tourism". The Tribune. 18 January 2019. ^ Roy, Christian (2005). Traditional Festivals: A multicultural encyclopedia. 2. ABC-CLIO. pp. 192–193. ISBN 9781576070895. ^ Knapp, Stephen (2006). "The Dharmic Festivals". The Power of the Dharma: An introduction to Hinduism and Vedic culture. iUniverse. p. 94. ISBN 9780595837489. ^ Kerkar, Rajendra (5 October 2011). "Saraswati Puja: Worshipping knowledge, education". Times of India. Archived from the original on 10 June 2018. Retrieved 19 October 2015. ^ "Haryana to celebrate Saraswati Mahotsav on Jan 28". The Daily Pioneer. 7 January 2017. Archived from the original on 17 January 2018. ^ "Navratri rituals: Golu, Saraswati puja, Vidyarambham ..." The Deccan Chronicle. 5 October 2013. p. 4. Archived from the original on 15 October 2013. ^ "Thiruvananthapuram gears up for Vidyarambham day". The Hindu. 11 October 2013. Archived from the original on 14 October 2013. ^ Than Tun (December 1976). "Saraswati of Burma" (PDF). South East Asian Studies. 14 (3): 433–441. Archived from the original (PDF) on 4 December 2014. ^ a b Seekins, Donald (2006). Historical Dictionary of Burma (Myanmar). ISBN 978-0810854765. ^ Silverstein, Josef (1989). Independent Burma at forty years. Monograph Southeast Asia Program. 4. Cornell University. p. 55. ISBN 978-0877271215. ^ Ludvik, Catherine (2001). From Sarasvati to Benzaiten (PDF) (Ph.D.). University of Toronto: National Library of Canada. Archived from the original (PDF download) on 11 September 2014. ^ Suzuki, T. (1907). "The seven gods of bliss". The Open Court. Vol. 7 no. 2. Archived from the original on 7 April 2014. ^ a b Wolters, O.W. (1989). History, Culture, and Region in Southeast Asian Perspectives. pp. 87–89. ISBN 978-9971902421. ^ McFarland, George. Thai-English Dictionary. p. 790 – via Google Books. ^ Patit Paban Mishra (2010). The History of Thailand. ISBN 978-0313340918. ^ "Saraswati, day of knowledge descent". The Bali Times. 2013. Archived from the original on 5 December 2014. ^ Pande, G.C. India's Interaction with Southeast Asia. 1. pp. 660–661. ISBN 978-8187586241. ^ a b Zurbuchen, Mary Sabine (2014). The Language of Balinese Shadow Theater. Princeton University Press. pp. 49–57. ISBN 978-0691608129. ^ Kruger, Vivienne. Balinese Food: The traditional cuisine & food culture of Bali. pp. 152–153. ISBN 978-0804844505. ^ Gonda, Jan. "Section 3: Southeast Asia Religions". Handbook of Oriental Studies. Brill Academic. p. 45. ISBN 978-9004043305. ^ Jamgon Mipham (2000). Mo: The Tibetan Divination System. Shambhala. pp. 149–150. ISBN 978-1-55939-848-0 – via Google Books. ^ Khenchen Palden Sherab (2007). Tara's Enlightened Activity: An oral commentary on the twenty-one praises to Tara. Shambhala. pp. 65–68. ISBN 978-1-55939-864-0 – via Google Books. ^ Jampa Mackenzie Stewart (2014). The Life of Longchenpa: The Omniscient Dharma King of the Vast Expanse. Shambhala Publications. ISBN 978-0-8348-2911-4 – via Google Books. ^ "Buddhist Protector: Shri Devi, Magzor Gyalmo Main Page". www.himalayanart.org. Archived from the original on 26 October 2017. Retrieved 26 October 2017. ^ "Prayer to Sarasvati" – via Google Books. ^ Kilty, Gavin (15 June 2001). The Splendor of an Autumn Moon: The devotional verse of Tsongkhapa. Wisdom Publications. ISBN 0861711920. Archived from the original on 25 January 2018. Retrieved 24 January 2018. Also: "The Splendor of an Autumn Moon: The devotional verse of Tsongkhapa". Retrieved 24 January 2018 – via Google Books. This article incorporates text from a publication now in the public domain: Chisholm, Hugh, ed. (1911). "Sarasuati" . Encyclopædia Britannica (11th ed.). Cambridge University Press. Kinsley, David (1998). Tantric Visions of the Divine Feminine: The ten mahāvidyās (Repr. ed.). Delhi: Motilal Banarsidass. ISBN 81-208-1523-8. Ankerl, Guy (2000). Coexisting contemporary civilizations: Arabo-Muslim, Bharati, Chinese, and Western. INU societal research: Global communication without universal civilization. 1. Geneva: INU Press. ISBN 2-88155-004-5. "Sarasvati, The Goddess of Learning". Stephen Knapp. Je Tsongkhapa. "Prayer to Sarasvati". Wisdom Publications. The Splendor of an Autumn Moon The Devotional Verse of Tsongkhapa. Translated by Gavin Kilty – via Google Books.